When I first got acquainted with the neurologist Oliver Sacks and his work, it was through Awakenings, both the book and the movie. I was a young woman then and Oliver Sacks was someone to look up to. He also seemed like a distant, avuncular academic figure. But readers are in for a shock here. First, Oliver Sacks comes out as gay (in a nondefensive way, but this must have cost him some angst, considering he has been in the closet all his professional life). Second, and even more shocking to me, actually, he comes out as a former weightlifter and motorcycle fanatic! 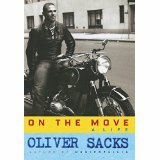 A strapping young Oliver Sacks on his bike. The best parts of the book explore his self-destructive youth in the late 1950s, where he emigrated to the US, began residency training, first in San Francisco and then at UCLA, and very quickly became addicted to amphetamines. The memoir gets even more interesting as he shows how he kicked the amphetamine addiction and began to slowly explore writing as a “metier,” faced with opposition and sabotage from bosses and colleagues in New York, where he had moved, and even, eventually, his publisher. Sacks is a lovable man, but a few revealing passages show how difficult he could be, and how he didn’t play the game at crucial points in his career. He forged his own path, meaning that for years he was not associated with any hospital and roved around visiting patients on a consultant basis. This must have been very painful for Sacks, who put so much of himself into his work that he was celibate for 35 years. His family background as the youngest son of two Jewish doctors is explored in depth, including his relationship with his schizophrenic brother, Michael. Sacks admits that his youthful decision to leave London was partly caused by his oppressive relationship with Michael, just a couple of years older, who could be difficult and violent when not medicated and who lived at home until their parents died. As with many other complex relationships portrayed in the book, Sacks does not try to make himself look good in the reader’s eyes. His high-powered mother denounced his homosexuality early on, but he says in a revealing insight after her death that she was the person he felt the closest to in his life. One of my favorite stories in the book is the one of Sacks confronting a raging bull on a Norwegian mountain trail. He lived to tell the tale, just about (though enduring the trauma of a broken leg and having to drag himself down the mountain for hours), and the whole episode became the basis for his book A Leg to Stand On, where he explores the disturbing post-surgery complication of his injured leg appearing alien to him and initially not responsive to rehab. The way he blithely ignored the sign warning that there was a bull on the mountain and then came face to face with this enormous creature, who expanded in front of his horrified eyes to grotesque proportions, is symbolic of Sacks’s whole life. It seems that he constantly courted death in one form or another and lived to tell the tale. On the Move, in fact, reveals many incidents of self-sabotage, accidents, and failures, which are surprising given Sacks’s aura of success…but serve as an important and poignant reminder that great success in one arena does not guarantee “an easy ride” in life. That this memoir is published just as Oliver Sacks is facing his own “final battle” with cancer gives it an exquisite urgency. 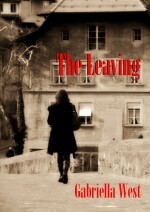 We meet him, the real man, just as he takes his leave… But at least we get to meet him. One of the best books of the year, for me. This entry was posted in LGBT, Reviews and tagged addiction, Awakenings, cancer, gay men, healing, Jewish, LGBT, London, memoir, motorcycles, neurologist, New York, Oliver Sacks, On the Move, San Francisco, weightlifting. Bookmark the permalink.